Preheat oven to 180°C (350°F). Place the zucchini in a clean tea towel and squeeze outas much liquid as possible. Place the zucchini in a large bowl. Add the sweetpotato, dill, parmesan, onion, eggs, flour, salt and pepper and stir well tocombine. 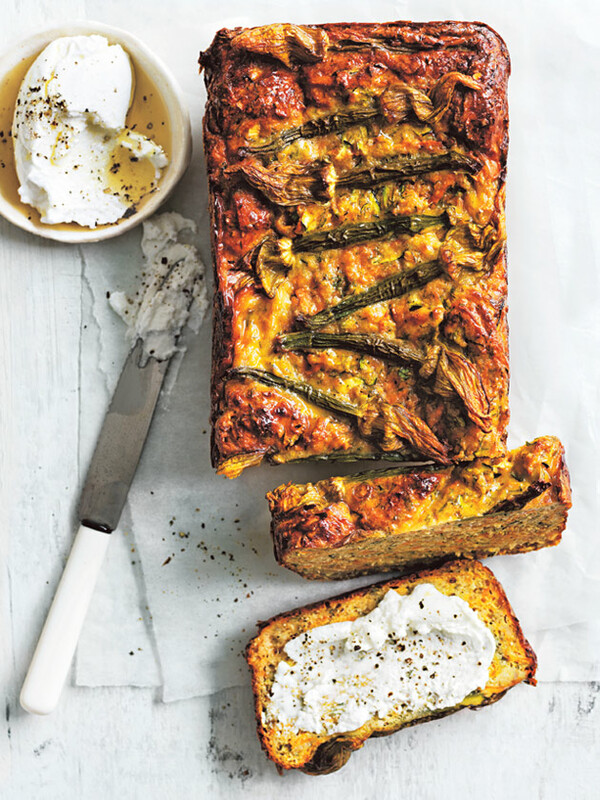 Spoon into a lightly greased 10cm x 20cm loaf tin lined with non-stick baking paper. Smooth the top and press the zucchini flowers into the top. Cook for 1 hour 30 minutes or until cooked when tested with a skewer. Set aside to cool in the tin for 10 minutes before turning out onto a wire rack to cool completely. Serve with goat’s curd, pepper and oil. Serves 8–10.